I’m excited for the guys that made the team. I’m concerned the best goalie got no pre tournament action. Jake deserves to be the starter. As for cutting someone on Christmas Eve I think it stinks. They did it to Grizz in ufa Russia a few years ago. It puts a sour taste in my mouth. Chad is a great player who was very loyal to the USA program. I have my doubts about the leadership of USA hockey and this coach. I don’t like saying it but you never see controversy like this on team Canada. I don’t buy into all the hype from evaluators of USA hockey find me a coach who is a proven winner and let him pick the team. Not the start to this tournament I was looking for. If Team USA plays in the championship game Friday Jan 5th do the BU players stay and play or do they go home to play for BU whom also have a game Jan 5th..
They’ll stay and play the USA game. A shame from a BU perspective, but these kids work their whole lives for the chance to play in something like a medal game at the World Junior Championships. 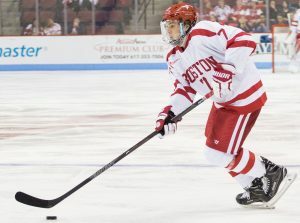 BU will likely be shorthanded against Union on Jan. 5 with six defensemen and 11 forwards.